Albania and Montenegro have the highest use of renewable energy in the region. According to data published by Eurostat on the use of the renewable energy in European Union countries, in 2017, about 34.6% of the total energy consumed in Albania came from renewable energy sources. By 2020, Albania intends to achieve about 38% of renewable energy from renewable sources. 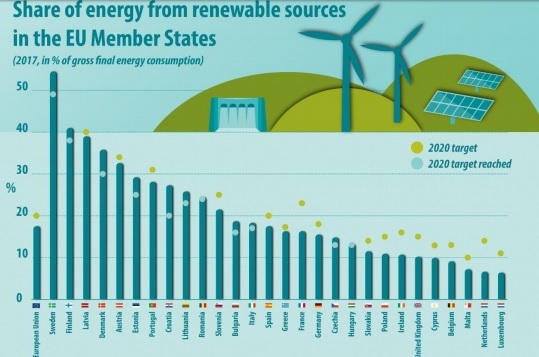 Among the candidate countries to be EU member states, Montenegro has the highest share of renewable energy use, with 40% of the total energy consumed in 2017. While is expects that by 2020 the share of the renewable energy sources will drop to 33%. In the European Union the share of the renewable energies in 2017 was estimated at 17.5% out of 17% in 2016. The share of renewable resources in final gross energy consumption is one of the key indicators in the EU 2020 strategy. The EU objective is to use about 20% of the energy from renewable sources in 2020 and at least 32% by 2030. Among the European Union countries, Sweden and Finland have the highest share of renewable energy used by renewable sources, which use respectively 54.5% and 41% of energy from renewable sources. Then comes Latvia (39.0%), Denmark (35.8%) and Austria (32.6%). While countries like the Netherlands and Malta have the lowest share of renewable energy sources. Each EU Member State has its 2020 target. 11 states have already reached the required level to meet their 2020 national targets, such as Bulgaria, the Czech Republic, Denmark, Estonia, Croatia, Italy, Lithuania, Hungary, Romania, Finland and Sweden.